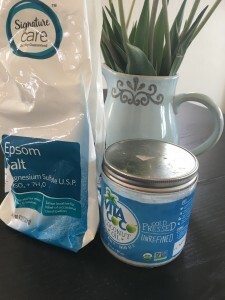 Next to coconut oil epsom salt is a favorite staple in my bathroom. Epsom salt is an awesome additive to take any bath up a notch. Its benefits and uses are numerous. Epsom salt added to a bath can increase your internal levels of magnesium naturally without supplementation. We are deficient in magnesium these days because our soil does not have the nutrients it use to. Its also better absorbed through the skin then through the stomach. Healthy magnesium levels help reduce pain and inflammation throughout the body. 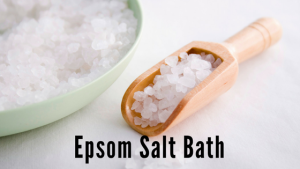 You can use epsom salt for more then just a bath. Relieve a minor sunburn with 2 tablespoons epsom salt and 1 cup cold water. Soak a washcloth in the water and apply to skin. You can also relieve itchy skin and bug bites with the same recipe above but added to a spray bottle. Spray on irritated areas. Take an epsom salt bath next time you have a cold or the flu. Epsom salt can aid in the detoxifying process leading to a shorter duration in symptoms. This bath can be done once a week or only when you want. In a hot bath add 1 cup epsom salt, 10 drops lavender essential oil, and 1/2 cup of baking soda. Soak for at least 20 minutes. This will draw out toxins, balance your pH, and lower stress. My all time favorite epsom salt bath recipe is. Add 1 cup epson salt and 1 cup coconut oil into a hot bath. You can add an essential oil if you want too. Soak for at least 12 minutes. Adding coconut oil will make this bath extra hydrating. This is a great bath prior to bed time. Add in Lavender essential oil and enjoy a restful night sleep. *The bath surface will be slick so be careful!